Ten persons A, B, C, D, E, P, Q, R, S and T are sitting in two parallel rows and all of them are facing each other sitting in opposite rows but not necessary in the same order. In Row-1, P, Q, R, S and T are sitting and all of them are facing north while in Row-2, A, B, C, D and E are sitting and all of them are facing south. The persons who are sitting in the Row-1 having their ages in multiple of four between 10 to 50. The persons who are sitting in Row-2 having their ages in multiple of seven between 15 to 80. Note: The elder person is sitting to the right of the younger person in each row. No younger one is sitting to the right of elder. 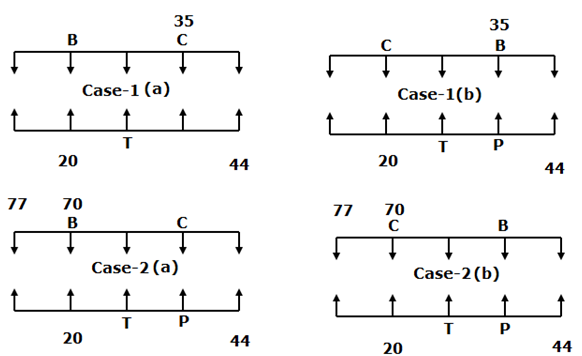 The one whose age is multiple of 11 sits second to the right of T and either one of them sits at the extreme ends of the row.The immediate neighbour of T faces the person who has the age in multiple of 5.Only one person sits between B and C, neither of them sits at the extreme ends of the row.The one whose age is multiple of 10 sits second to the left of P and faces the immediate neighbour of D.The one whose age is thrice the age of S sits third to the right of S.The one whose age is multiple of 9 sits to the immediate right of D. The difference between the ages of T and E is 3 years. R is elder than D. A’s age is not an odd number. D’s age is an even number but not in multiple of 4. S does not faces the immediate neighbour of B. Who among the following is the youngest person in the group? The one whose age is multiple of 11 sits second to the right of T and either one of them sits at the extreme ends of the row. Here, 44 years is the only choice for multiple of 11 and the one who has 44 years not possible to sit in the middle of the row. If we make the person who sits at the middle of the Row-1 has 44 years, then the person sits at the extreme right end must be has 52 years. The immediate neighbour of T faces the person who has the age in multiple of 5. Only one person sits between B and C, neither of them sits at the extreme ends of the row. 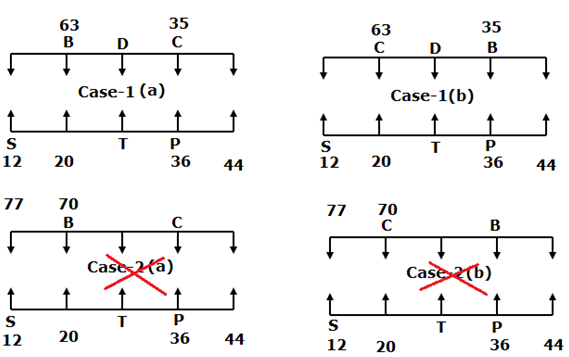 The one whose age is multiple of 10 sits second to the left of P and faces the immediate neighbour of D.
The one whose age is thrice the age of S sits third to the right of S. The one whose age is multiple of 9 sits to the immediate right of D.
The difference between the ages of T and E is 3 years. R is elder than D. A’s age is not an odd number. D’s age is an even number but not in multiple of 4. S does not face the immediate neighbour of B. Who among the following persons sits second to the left of the one who faces Q? What is the difference between the ages of D and S (in years)? Which of the following pairs represent the persons who are oldest in the both rows? ‘Stablize something better’ is coded as ‘V@18 G@5 L#7’. What is the code for ‘Journalist’? 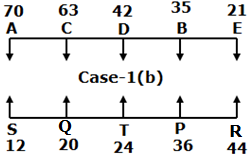 Which of the following represents the code ‘B@13 W@4’? What is the code for ‘Progress’? What is the code for ‘Changed’? What is the code for ‘Against Encounter’? 1) Who among the following is the youngest person in the group? 2) Who among the following persons sits second to the left of the one who faces Q? 4) What is the difference between the ages of D and S (in years)? 5) Which of the following pairs represent the persons who are oldest in the both rows? 6) What is the code for ‘Journalist’? 7) Which of the following represents the code ‘B@13 W@4’? 8) What is the code for ‘Progress’? 9) What is the code for ‘Changed’? 10) What is the code for ‘Against Encounter’?